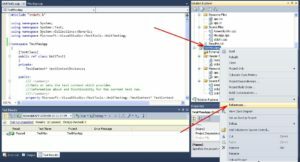 This topic describes a step-by-step process of creating the simplest unit test in Microsoft Visual Studio 2010 (C++) for a CLR Console Application. Using this example, you can learn to create your own Unit-tests. The example also demonstrates the use of the Assert class for testing the work functions. For a CLR Console Application, develop a Unit-test that tests the Max3() function, which defines the maximum element of three numbers. For the Max3() function, set the TestMax() test method. Check the function. Project name set as MaxApp (or, if desired, another). In our case, the project folder is set to “E:\Test\” (the “Location:” field). After selecting OK, an application of the CLR Console Application type will be created. 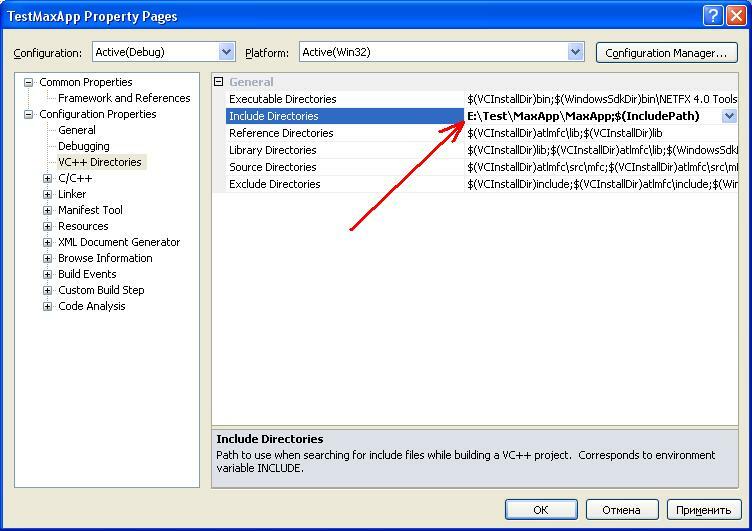 After creating the application, the Microsoft Visual Studio text box will have an approximate view, as shown in Figure 2. As you can see in Figure 2, the MyApp.cpp module contains the connection of the module “stdafx.h” and the main() function, which is the entry point to the program (this function is associated with the C++ program). This function will need to be tested using Unit-test in Microsoft Visual Studio. Because this program will be tested from another testing module, then nothing needs to be entered in the main() function. Since, according to the condition of the task, you need to test the operation of the Max() function. But this will already be done from the testing module. At the moment our program is ready for testing. This will open the “Add New Project” window, shown in Figure 3. 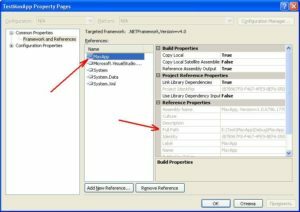 In the window a templates group of Visual C ++ – Test is selected. From the proposed templates, the project template “Test Project” is selected. The “Name” field indicates the name of the project that will test our program. You need to set, for example, TestMaxApp. The project is located in a separate folder “E:\Test\MaxApp”. After selecting OK, the system creates new project files that will be tested, as shown in Figure 4. A file (module) is created with the name “UnitTest1.cpp”. In this file, you need to enter the code that will test the Max() function from the MaxApp.cpp module. the TestMaxApp project. This project is designed to test the functions of the MaxApp project. The program code that will test the Max() function will be added to the project file UnitTest1 of the TestMaxApp project. In the TestMaxApp project, the UnitTest1.cpp test file is the main test file. 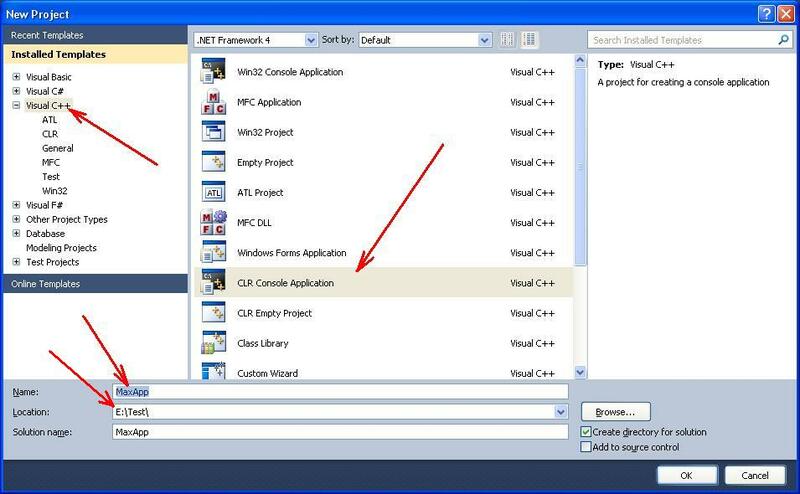 This file contains methods that will test the functions of the project “MaxApp.cpp”. The TestMaxApp project can contain any number of files that contain tests (for example, UnitTest2.cpp, UnitTest3.cpp, etc.). As you can see from the above code, the file contains a class named UnitTest1. The class has a public method named TestMethod1().Before implementation of TestMethod1() method, the [TestMethod] attribute is placed. 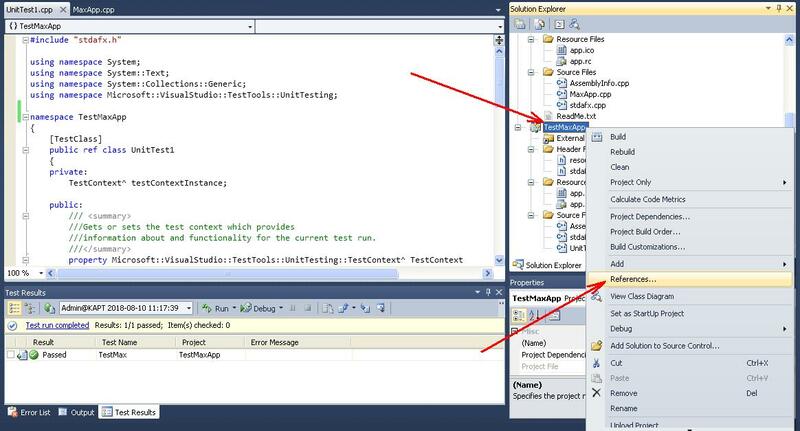 This means that in the body of the method, you need to enter code that will test the functions of the MaxApp project. Similarly, the [TestClass] attribute is placed before the UnitTest1 class. This means that there are testing methods in the class. You can change the method names and add new methods that are marked with the [TestMethod] attribute in the UnitTest1.cpp module. With this in mind, in the UnitTest1.cpp text, the TestMethod1() method must be renamed to TestMax(). 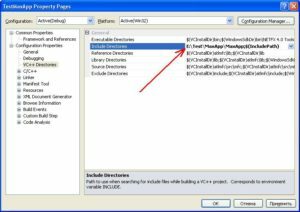 To access the Max() function of the “MaxApp.cpp” module of the MaxApp project from the TestMaxApp project, you need to call this module using the #include directive. 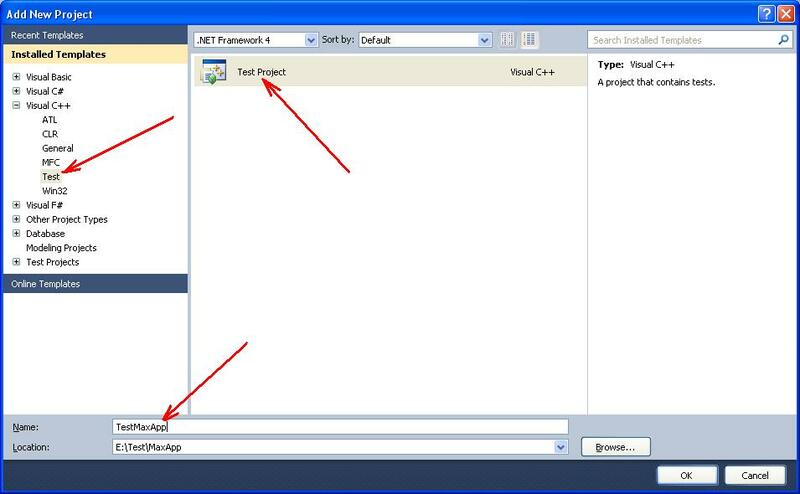 in the references to the Microsoft Visual Studio assemblies, configure the folder with the MaxApp project so that it is automatically connected. After this, you can access the “MaxApp.cpp” file by its abbreviated name. In this topic, both methods are described. This method is more simplified. It is convenient when you need to connect a small number of files to the project for testing. This specifies the full name of the MaxApp.cpp file on the disk, in which the Max() function is located, which you need to test. avoiding the use of a long name as shown in section 4.5.1. First of all, the “References …” command is called from the TestMaxApp context menu as shown in Figure 5. Another way to call – the command Project-> References … (previously need to be select TestMaxApp project). 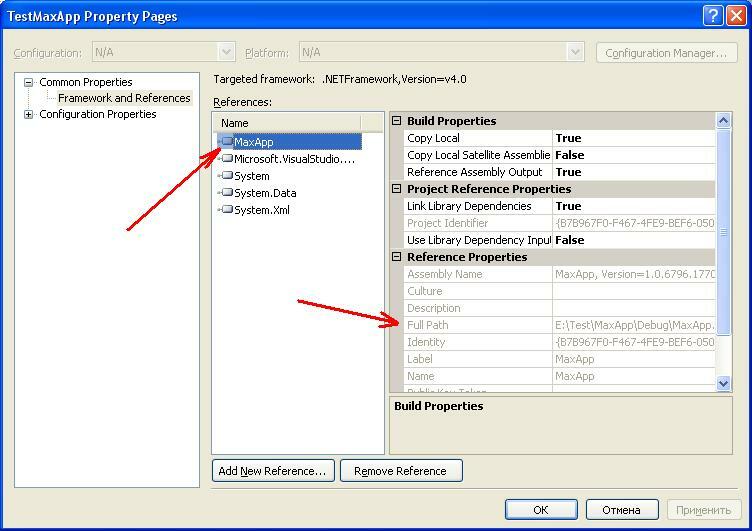 This opens the “TestMaxApp Property Pages” window which is shown in Figure 6. 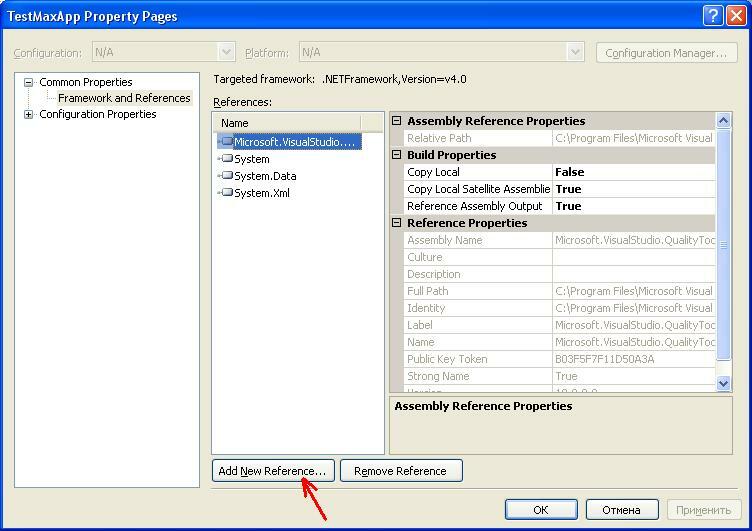 In the “TestMaxApp Property Pages” window, you first need to activate the “Common Properties” -> “Framework and References” tab. 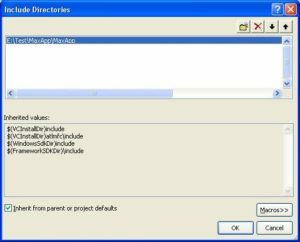 Then you need to select the command “Add New Reference …”. 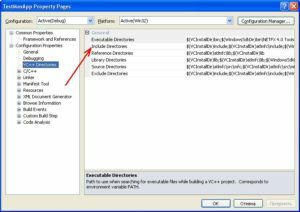 This command allows adding new folders with modules to the project, methods (functions, resources) of which can then be included in the project by the #include directive. After selecting the command, the Add Reference window, shown in Figure 7, opens. 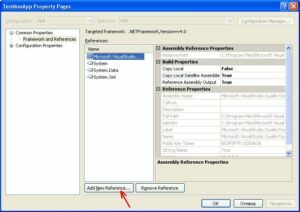 After selecting OK, you return to the previous window, in which the reference to the MaxApp project will be displayed in the list of references to the assemblies. That’s not all! 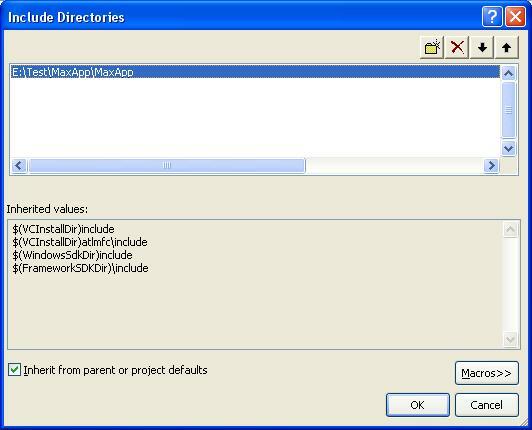 The next step is to connect the MaxTest project folder to the “Include Directories” list. In the “General” list, “Include Directories” is selected. 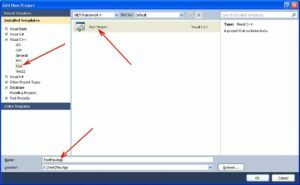 As a result, a dropdown list is opened, in which you need to select the command “<Edit …>”. 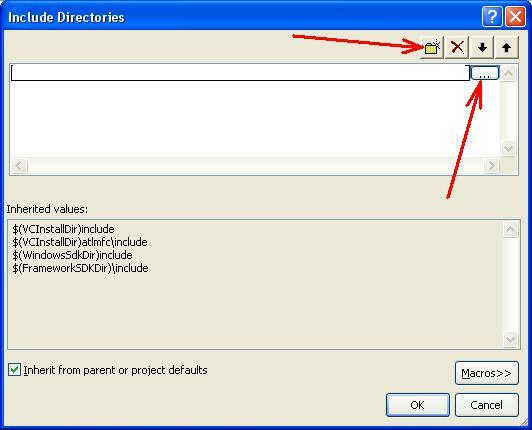 After that, the “Include Directories” window shown in Figure 10 opens. 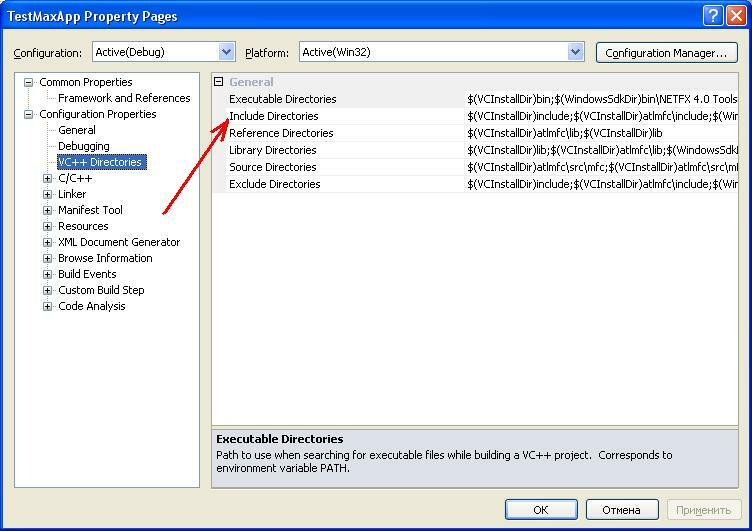 After selecting, the Include Directories window will have the appearance as shown in Figure 11. To go to the previous window, select OK.
To proceed to writing the program test code, select OK. The above code calls the function AreEqual() from the Assert class. This function compares the value that was returned from the Max() function and the value 6. In this case, the number 7 (maximum) is compared with the number 6. For this way, the test will not be passed, since 7 is not equal to 6. As a result, the Assert::AreEqual() function throws an exception, which will be displayed in a special window (see paragraph 5). After starting the test, the result can be viewed at the bottom of the “Test Results” window. As you can see, the test is failed. This is logical, because in the function Assert::AreEqual() we compare the numbers 6 and 7, which are different from each other. Here the number 6 is specially introduced instead of the number 7. The result window is shown in Figure 14. Now we can conclude that the function Max() was developed correctly. In this topic, two projects are developed in the solution. One MaxApp project contains the Max() function to be tested. The second project TestMaxApp contains methods that test. 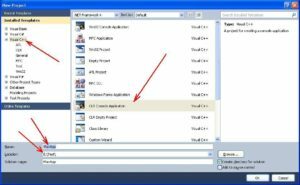 In Microsoft Visual Studio, each project is run using various menu commands. For example, the MaxApp project is launched in the standard way from the Run menu. And the test project TestMaxApp is run from the special menu “Test”.